UPDATE: (2018-04-23) - While revising this post to add more detail I went through the steps to add a property again. However, this time I googled "Google Webmaster Tools" and then used the link in search (https://www.google.com/webmasters/tools/home). Voila -- It worked this time! As per posting best practices, I've added the pertinent details in an "answer" below for the benefit of those who may have a similar issue. When I wrote the post I used a link from a post on a website somewhere, which looked exactly the same as the link I used with success today, though it failed previously. I'm not really a newbie, but this might be a newbie question. I just verified a property (website) I own in Google Search Console (now part of "Google Webmaster Tools" suite). However, the property doesn't show up for some reason. By verified I mean I added the property to my website, verified it (by uploading a .html file that began with "Google", followed by an alphanumeric sequence), then clicked the "Add A Property" button. I'm not sure what I'm doing wrong here. I'm stumped. 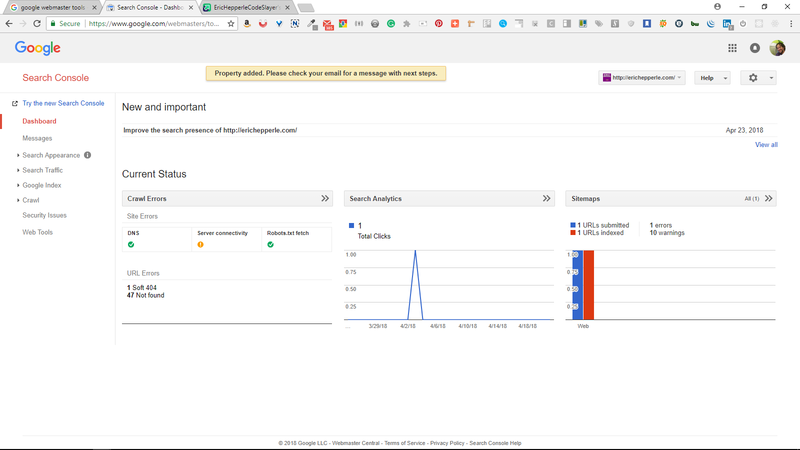 Why is my website not showing up in Google Search Console? How can I get my website to show up in Google Search Console? Why is my counter not incrementing, but instead returning 'NaN'? Is there some special way to declare an object property as a number before assigning a value? What am I missing in my understanding to make this work? How can I increment my object count properties? While revising this post to add more detail I went through the steps to add a property again. However, this time I googled "Google Webmaster Tools" and then used the link in search (https://www.google.com/webmasters/tools/home). Voila -- It worked this time! I was using an old link. I suppose it is possible that even though the link I used last Friday led me to something that looks almost exactly like what I'm looking at today (Monday), that it could have been a mirror, or something, right? This might indicate that the "under-construction" hypthesis is likely. I was tired and wasn't able to complete instructions correctly. While it is true that I was tired when attempting to add a property, it's not rocket science and I know what I experienced. Your mileage may vary. And I hope my contribution to this particular challenge with newly verified google search console/webmaster tools properties (a possible quirk, that could still show up in the future) will help somebody else down the road, into the future. Not the answer you're looking for? Browse other questions tagged seo google-analytics google-search-console search-engines site-verification or ask your own question.